Does anyone have any details on the planned closure of Weston Street? Why is it closed for 3 weeks? It strikes me as quite ill-timed, since Borough High Street is closed southbound for the foreseeable future. Do SE1 members think it is worth asking TFL or Southwark Council about it? Does anyone have an e-mail address they could suggest? Don't think Weston Street would be a TfL managed road....best guess is its a Southwark road...and we all know how absoloutly useless they are when looking at the bigger picture! It is only closed in the tunnel under London Bridge station. It does not affect the whole street. And bicycles can still use it, yeah! Thanks for the information James. It's good to hear that the whole street is not blocked. 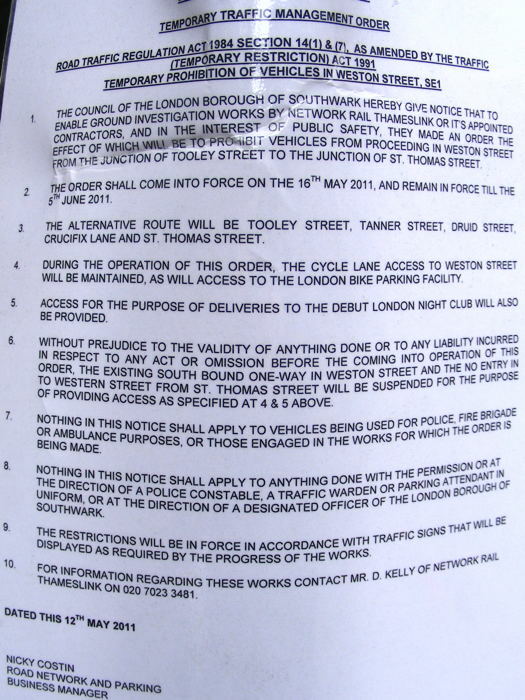 But I am not impressed that permission to close was given at a time when Borough High Street is closed southbound. Maybe the works are urgent and could not be postponed.